*Complimentary Upgrade to All Inclusive Plus! 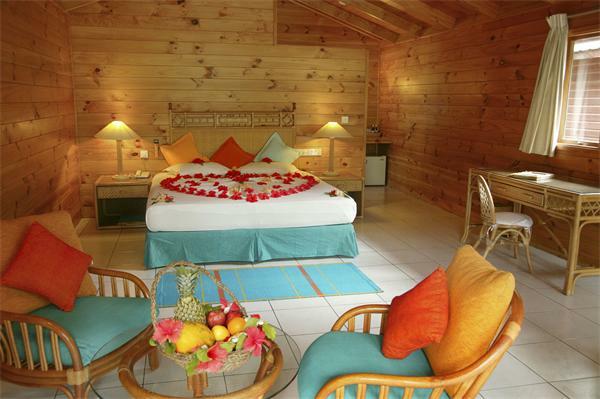 Honeymoon inclusions: – Fruit platter and flowers in room on arrival. 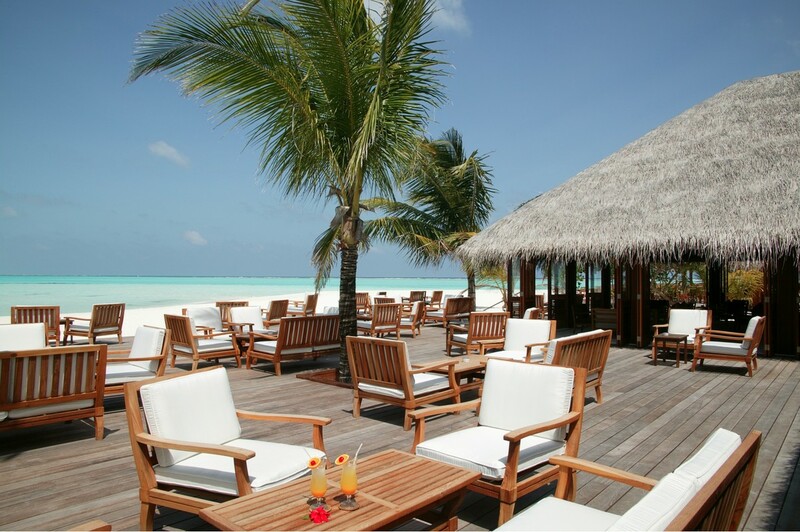 Surrounded by a beautiful lagoon and long stretches of white, sandy beach, is the only resort on the island of Meerufenfushi. Your speedboat transfer from Male’ International Airport is a scenic, 55 minutes ride to this most Eastern island resort in the North Male’ Atoll. Located in a “U” shaped block near the Dhoni Bar pool, with a wooden sun deck and a privacy screen between the rooms, and share a shaded area beneath the coconut palms with a lovely view of the tropical gardens. Size: 50 sqm. 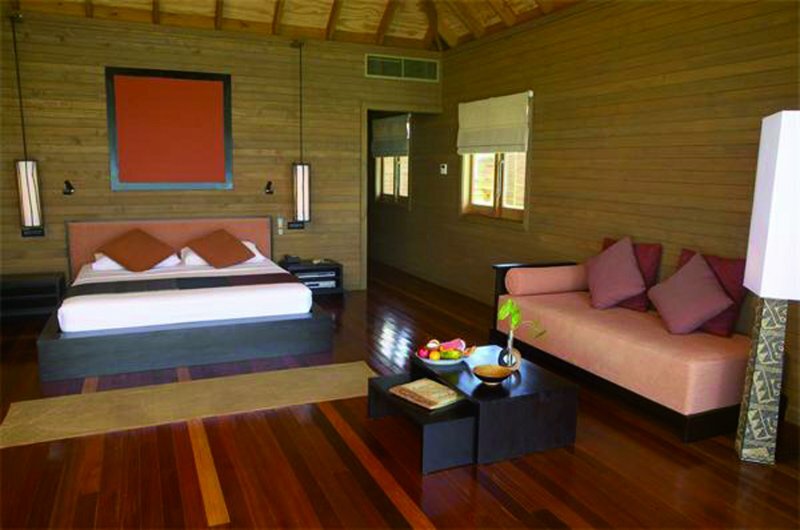 Located on the beach, and are spacious, individual wooden bungalows offering a beautiful view of the lagoon, and feature a semi open-air bathroom. Size: 50 sqm. 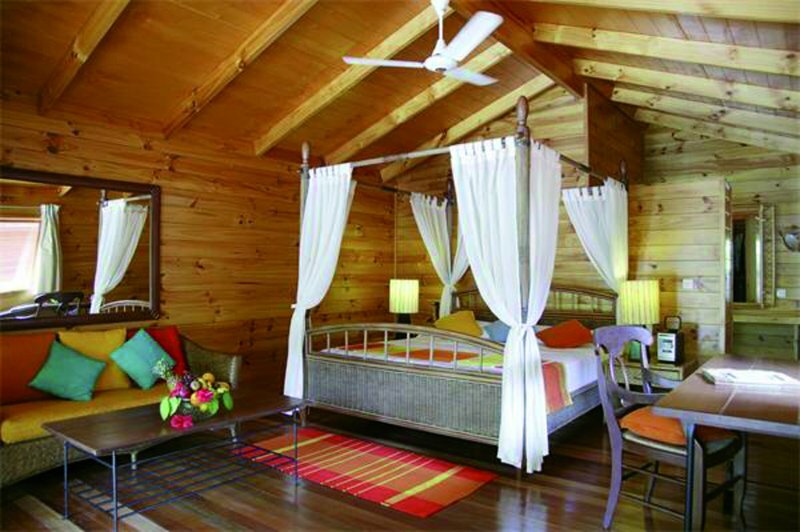 Beach Villas with a private, walled-in outdoor area featuring a Jacuzzi for two “under the stars”, a wooden sundeck with chaise lounges, a shade Pavilion, a small tropical garden, a four poster bed and CD player. Size: 80 sqm. Located on the beach at the water’s edge, with an upgraded bedroom including a four poster bed, a spacious bathroom with double sinks, a private, walled-in outdoor area featuring a Jacuzzi for two “under the stars”, a wooden sundeck, chaise lounges, a shade umbrella, tropical plants, a private sundeck with stairs into the sea and a spectacular view of the lagoon. Size: 70 sqm. Located over-the-water, in the lagoon…a short walk along your private jetty to this secluded hideaway featuring a large bedroom, a sitting area with a DVD player, a tea/coffee/espresso machine; a spacious bathroom with double sinks, a Jacuzzi for two, a private sundeck and stairs into the sea. Size: 85 sqm. 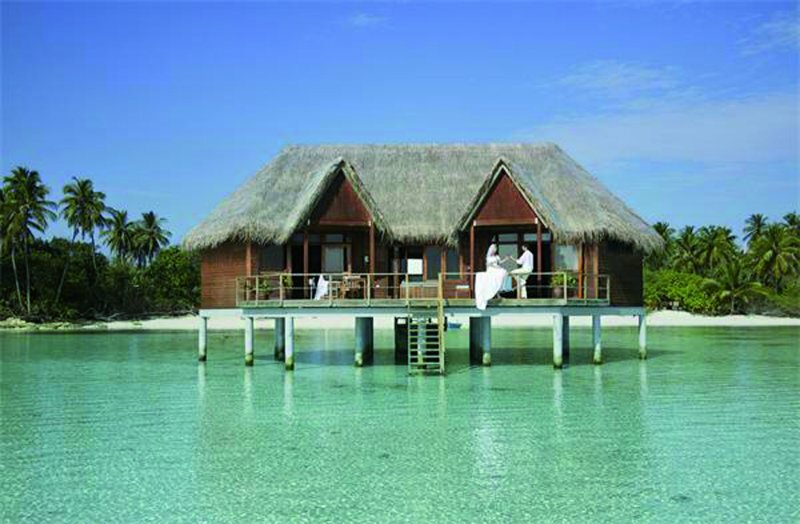 Located over-the-water, in the lagoon…a short “Dhoni” boat ride from shore. These exclusive, luxuriously appointed Suites feature the same facilities as the Jacuzzi Water Villa, plus a living room/dining room area, a stocked kitchenette for breakfast, a bathroom with bath and bidet, your private “lagoon” pool and a room service menu for dining on your sundeck/terrace. Size: 90 sqm. No fuss dining, just good food is the order of the day at Meeru. No dressing up to impress. 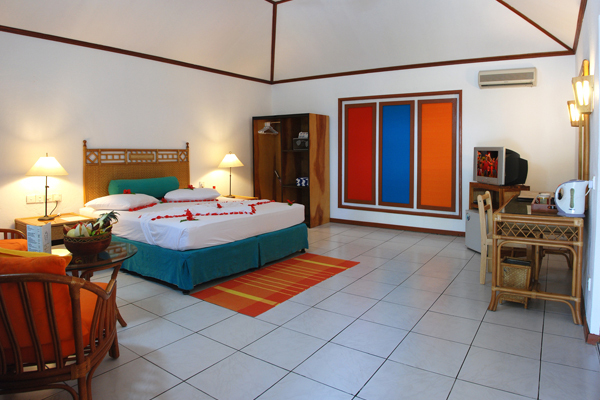 Just stroll in from the beach or from your room and sit down and enjoy. There are five restaurants and six bars where you will find everything you want, and at all hours of the day. So just continue to have fun and there’ll be plenty of food on offer just when you want it. Two main “sister” restaurants, serving the same buffet menu, conveniently located to best serve the guests. Even on the hottest day the breeze wafts through this amazing eatery. A tall sloping roof with cooling fans buzzing in the rafters. All meals are buffet, with the menu changing every day. A comprehensive breakfast is available to fuel up divers for the day ahead. Lunch and dinner buffets offer a wide selection of different kinds of food, salads, pastas, meat and fish, as well as a good sweet and fresh fruit selection. Vegetarians and people with special dietary needs can also be catered for, but they should let the resort know beforehand. 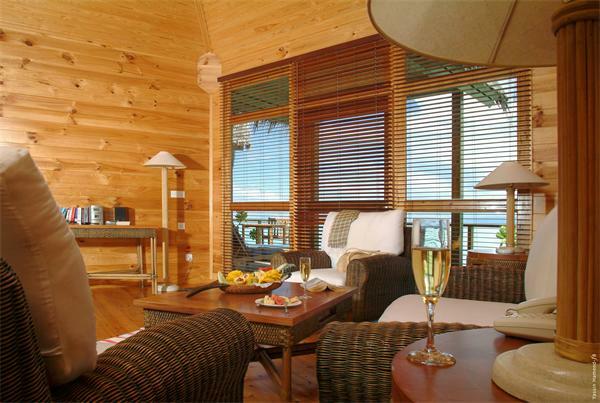 The Maalan Restaurant is exclusively for guests staying at the northern end of the island. (exclusively for guests 18 years and above). Offering a wide choice of snacks, the coffee shop is a relaxed place overlooking the sea and next to the swimming pool where light meals can be served while you’re lazing by the water. Room service is also available from the coffee shop up until 11.00 pm. The system offered here is flexible, so if you’re a late riser and miss out on the buffet breakfast, the Hungaanu Coffee Shop offers an a la carte breakfast menu between 9.30 and 11.30. In fact there’s no need to worry about missing any meals as there is a choice of snacks, pizzas, pastas, and more substantial dishes on offer until late at night, as well as a choice of ice creams and fresh fruit. Over-the-water Asian Wok Restaurant, specializing in Asian cuisine and Teppanyaki. Enjoy a truly amazing dining experience by being the chef. Hot volcanic rocks are delivered to your table with your entrée. Hear the sizzle and smell the aroma of your meal cooking before your very eyes. Each bite is juicy and delicious. The Goma, serving a menu of grilled specialties aboard a “restaurant” yacht anchored in the lagoon. Three other “optional” choices, Room Service and Private Dining in your room, and a selection of very special Dinners served on the Beach. Harmoniously designed in the turquoise lagoon, our Two Spa’s, one Over-Water-Spa and the other one on land offers the perfect environment to sooth your body, stimulate your mind and strengthen your spirit. With an innovative approach, combining West with East, traditional rituals with modern modalities, high touch with high tech, they honour the guest’s entirety and provide a most rewarding spa experience with a true sense of inner-self, well-being and beauty ensuring best results and benefits.